So, with a larger miniscule chunk of free time available to me I got to work on my mini sewing skills! The theme here was fairy oriented, what with the girls sorta momentarily obsessed with Winx Club and the Disney Fairies! I was aiming to make some cool fairy duds for every size doll we have. The one below on Rochelle is my favorite, needs some tweaking, but the overall design is firmed up and I have a pattern about ready for PDF (yay). This is probably my favorite MH doll, second wave Dead Tired Draculaura.. I just love her face. The dress she is wearing is from the same pattern as above without all the detail in the bodice and less of a boaty neckline… looks great on her. 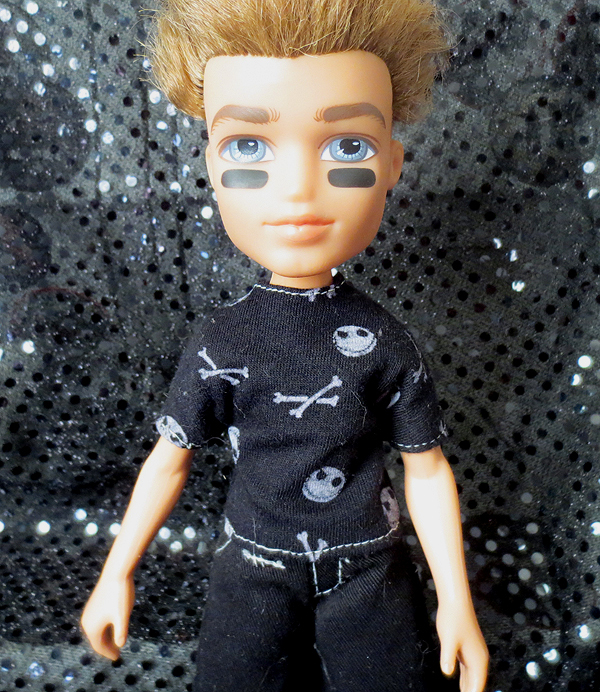 I made quite a few tees for the Bratz Boys, this one I made earlier in the summer but it’s one of my favorite knit prints. It’s a one piece pattern, so so easy. I didn’t design it, I found it somewhere.. HERE and I altered it just a tad.. perfect fit, comes together in mere minutes! My Scene Barbie’s got it goin on in her one shouldered fairy dress, this one also ended up being a one piece pattern design.. with a HECK of a lot of tweaking I managed to draft one to fit her (or the ‘belly button’ barbie), Rapunzel beneath her which is one of the newer lighter hard plastic Disney dolls and the Bratz body – both tall and short. I’ve got to scan the patterns yet, this one is pretty simple too. Might I just add here that I do not like sewing with organza. Really really do not like it and I wish I didn’t have so darn much of it! And finally on Catrine here, another simple tube design on some nice slinky stretchy fabric. 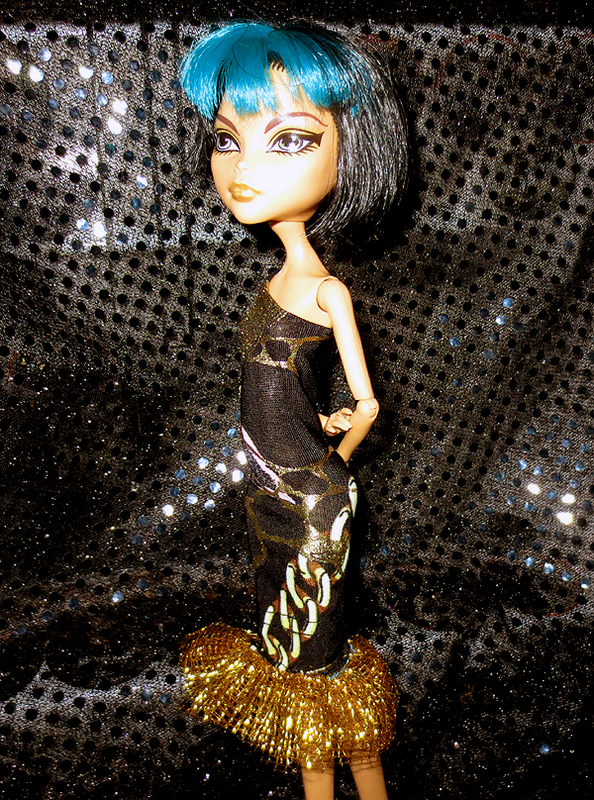 It looks fabulous on Cleo too. So so easy; measure and stitch up the tube in the back, cut the top on an angle and cut a small slit on the higher end to slip the arm through. Looks so awesome, I need more fabric like this! It rolls so nicely for a perfect edge …. need to hit the thrift shops! So there you have it, most of what I’ve been up to creatively.. someone remind me to post the patterns! Next American Girl Sewing: Monster High Costume!! FREE vest pattern! You are so talented. Love it! Hey, I love these dresses, they are soooooo cute! Can you please post the patterns for these. I make stuff for my little sister and she would love these dresses. Those dollies look so cute in their new dresses! Thank you for posting the patterns. If you make any dresses for the Disney fairies could you please post the patterns. I have found that the Disney Fairies bodies are very similar to barbie’s Skipper and Bratz bodies. There are lots of patterns out there for both of those, plus if you downsize all the Blythe patterns about 1/4 inch they fit too! where did you get that skully fabric on Draculara? Sorry for this late response.. I don’t know how I missed your comment!